If you have previous Pilates experience you may attend the classes without our new client introductory session. Please contact us or call (828) 333-2223 so we can get you started. 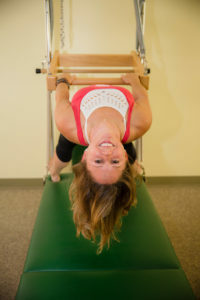 If you are new to Pilates equipment classes your safety comes first. That is why we recommend at least 3 private sessions or shared sessions with someone who is also new to gain a better understanding of the work, the equipment and what you will be doing in the group classes. Once you have completed your introductory sessions you may choose the type of classes you want to continue with. Rose Pilates offers private sessions, group equipment sessions, duo or trio sessions or mat classes. Our private pilates sessions are designed specifically for the individual and their over all fitness needs. The first private session involves a general health and fitness screening. We answer all your questions and discuss any concerns you may have about starting a Pilates program. The first session is taught at a slower pace simply because there is a lot of information about proper breathing, technique, form and an understanding of the equipment. Your first few sessions are important to give you a basic foundation and understanding of safety, form, what to expect, how to use the equipment and careful progression of the exercises. Our group pilates classes are small enough so you will still get the individual attention necessary to help you progress in the classes. Each instructor is highly qualified and trained to pay attention to each individual, even in the group classes. Most people say they feel taller, are breathing better and have better posture. Some people feel more ease of movement in their back, hips, shoulders and have less effort in their daily activities. We hope that you will take what you’ve learned from Pilates, integrate it into your life, deepen your understanding of your body and over all Feel Better! • All New clients get their first mat class free! • If you have previous Pilates experience you may attend the classes. If you are new to the Pilates equipment we offer Special rates to New Clients to help get you started. These private or semi private sessions will help orient you to the equipment where you will learn a basic understanding of the Pilates format using the Reformer and Tower. Once you have completed your introductory lessons you may continue with private or semi private lessons, or choose from the classes offered. Some students may advance to the group equipment classes without completing the 3 sessions pending teacher’s approval. First 3 private sessions offered at a discounted rate of $150. 1st Mat class free! Avoid using heavy creams, perfumes or sharp jewelry. Pilates work is done in bare feet or socks. We also sell Pilates socks that you can use exclusively for your Pilates lessons.You will be required to fill out a consent and brief health history form before starting. It is advised if you have any medical conditions that you be released to exercise by your physician.